Community Health Systems (CHS) announced that the Apple Health Records app for iPhones is now available to patients at approximately 100 CHS-affiliated hospitals. CHS worked with its EHR maker Allscripts' FollowMyHealth team to deploy Apple Health Records. Patients who have received care from a CHS-affiliated participating hospital can use their iPhones to receive and store details from their medical records, ranging from allergies and conditions to procedures and vitals. Patients can also include information about immunizations, labs, and medications, as well as receive notifications whenever their data is updated. 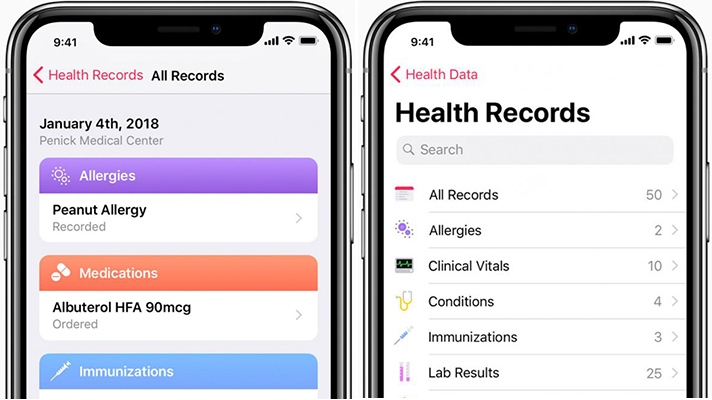 To ensure the security of transmitted data, Apple’s Health Records app is based on HL7's Fast Healthcare Interoperability Resources (FHIR), a standard for transferring electronic medical records. In addition, data in the app is encrypted and protected with the user’s iPhone passcode, Touch ID or Face ID, and the connection leverages OAuth 2.0, which allows users to authenticate once and create an enduring connection to their electronic health record (EHR) APIs. The most recent version of the FHIR specification was deployed earlier this month by Cerner, which is touting the backward-compatible FHIR R4 as key interoperability standard for healthcare app developers seeking to interface with its technology. The convergence of two threads--FHIR as a better interface standard, and APIs as a required part of EHR certification, are expected to have profound impact on future interoperability as EHRs and mobile technology play a more integral role in consumer-facing healthcare apps and services. “At CHS, we are rapidly expanding our digital health and consumer engagement strategies to provide patients with more convenience, more information, and more control over their healthcare experiences,” Lynn Simon, president of clinical operations and chief medical officer of Community Health Systems, said in a statement. Simon explained that by giving their patients an easy way to receive and track their medical information, it provides them an additional way to be active participants in managing their own health, which can lead to better outcomes. “Since most people keep their mobile devices with them, this means all of that medical information is accessible whenever it is needed,” she said. Simon noted putting health data literally in the palm of the patient’s hand could be critical in an emergency, and also enables patients to have more informed conversations with all of their physicians.